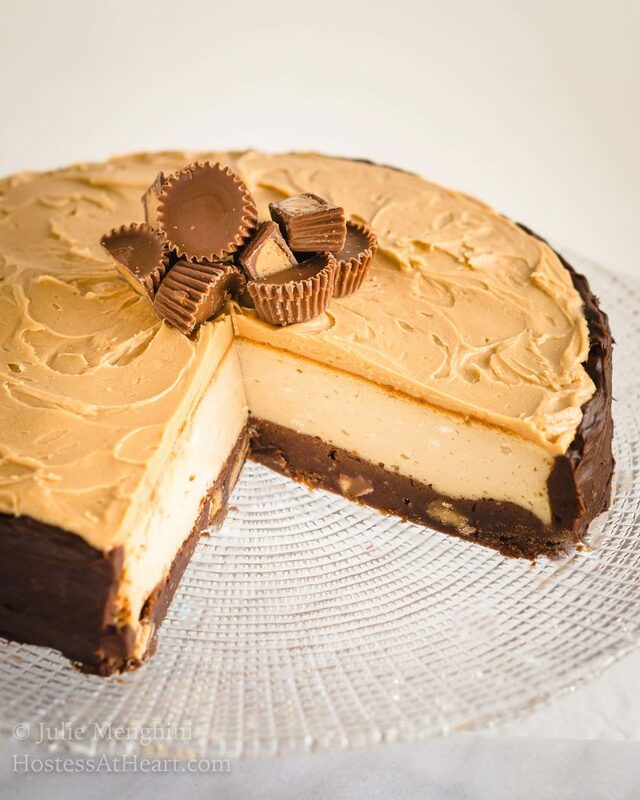 Buckeye Brownie Cheesecake is decadent and delicious. You’re going to want to make this rich and creamy cheesecake over and over. You’ve either said it or heard it, but that’s the best cake I think I’ve ever eaten. John said it and I heard it and agreed that this Buckeye Brownie Cheesecake is one of the best cakes I’ve ever eaten. Best of all, it wasn’t difficult following the recipe and was fun putting together. Back when I was just starting my blog I got to know Dini Kodippili from The Flavor Bender. Dini is one of those people that “make things happen”. I fondly refer to her as the mad scientist of cooking. I just marvel at the techniques she uses because most of them would never have entered my mind! Take “The Phoenix Cocktail” that is a shimmery cocktail that changes colors, where in the heck did that innovation come from? 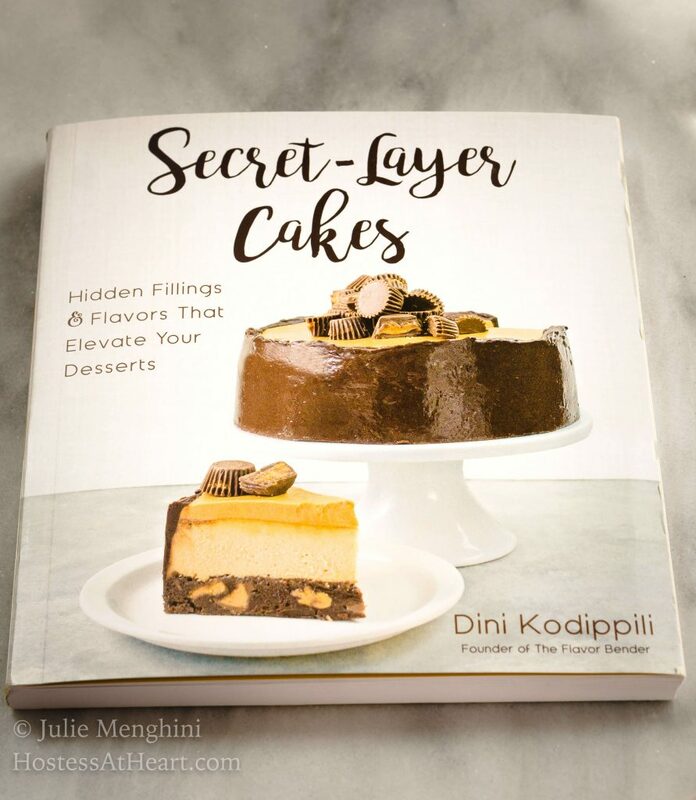 Dini is sharing more of her innovations in her new cookbook Secret-Layer Cakes. Some of her motivation for this book is her love of baking and sharing. I got my hands on this book as soon as I could and I made her Buckeye Brownie Cheesecake the very next day. In the spirit of sharing, she is giving my readers the opportunity to win a copy of this beautiful book. Her book is beautifully illustrated and is written so even us non-mad scientists can successfully recreate her works of art. 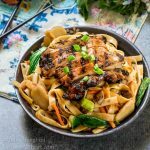 This recipe was simple enough to put together and I can’t wait to make some of her other ones. She has cakes for any occasion! John followed my progress (o.k. he licked the bowls, beaters, spatulas…). After I made it we ran out of sunlight and I couldn’t photograph it right away. Once I got my photography finished I texted John a picture of my masterpiece. He gave up a Christmas luncheon at work so he could finally enjoy a piece of this cake. When asked by his co-workers why he wasn’t staying, he just showed them the text that I sent him of the cake. I can’t repeat the comments he got, especially when he said he wouldn’t be bringing any of it back to work. 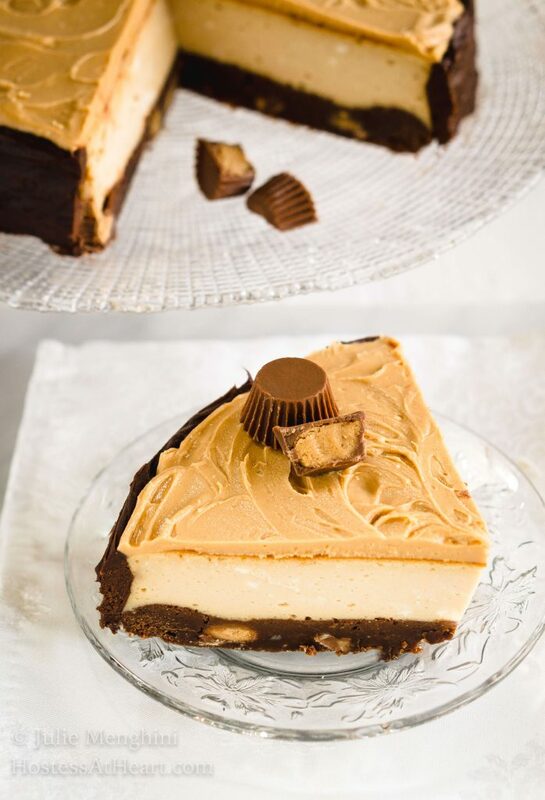 Buckeye Brownie Cheesecake is decadent and delicious. You're going to want to make this rich and creamy cheesecake over and over. Preheat the oven to 350°F. Butter an 8-inch springform pan and then line the bottom with parchment paper. Apply additional butter to the parchment paper and then dust bottom and sides with all-purpose flour. Melt the chocolate, butter, and salt together in a medium-sized bowl in 30-second increments in the microwave stirring between until smooth. Stir in the vanilla and sugar and let cool slightly. Add the eggs one at a time, whisking to combine after each addition. Fold in the flour until smooth and then add the peanut butter cup halves. Pour into the prepared pan. Bake for 15 minutes. Place on a wire cooling rack to cool slightly. Reduce the oven temperature to 300° after the brownie layer is baked. In the bowl of an electric mixer fitted with the whisk attachment, combine cream cheese and granulated sugar. Whip until smooth and creamy. Add the peanut butter, cornstarch, salt, and vanilla. Beat until smooth and creamy. Add the eggs one at a time, mixing after each addition. Wrap the outside of the springform pan tightly with two layers of aluminum foil to assure that it's completely sealed. Pour the Peanut Butter filling into the pan. Place a larger pan into the oven and fill the bottom with very hot water. Place the springform pan in the water bath. Add enough water to assure that the water comes up to the middle of the springform pan. Bake 60 to 70 minutes. until the cheesecake is set but slightly jiggly in the middle when you shake it gently. Turn the oven off and let the pan sit in the oven for 15 minutes with the door ajar. Cheesecake will continue to finish cooking and it helps prevent cracking. Remove the cheesecake from the oven and the water bath, and let cool completely; this can take up to 4 hours. Gently loosen the cheesecake from the pan and place it on a plate. If cake sticks, gently loosen it with a thin knife. Cover the cheesecake and refrigerate at least 8 hours or overnight. 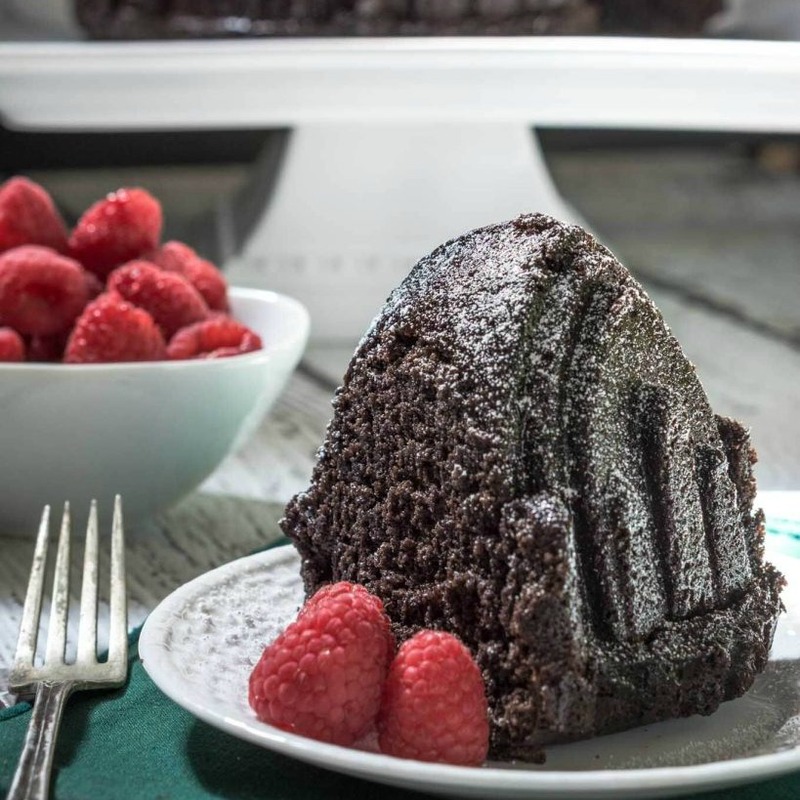 Combine the semi-sweet chocolate, cream, and salt in a microwave-safe bowl. Heat in 30-second intervals stirring in between until smooth. Allow mixture to cool until it thickens into a spreadable consistency. It's o.k. to cool it in the refrigerator, stirring occasionally. Melt the butter, salt, and peanut butter together in a microwave-safe bowl in 30-second intervals stirring in between. Add the powdered sugar and mix until smooth. The glaze will thicken as it cools. 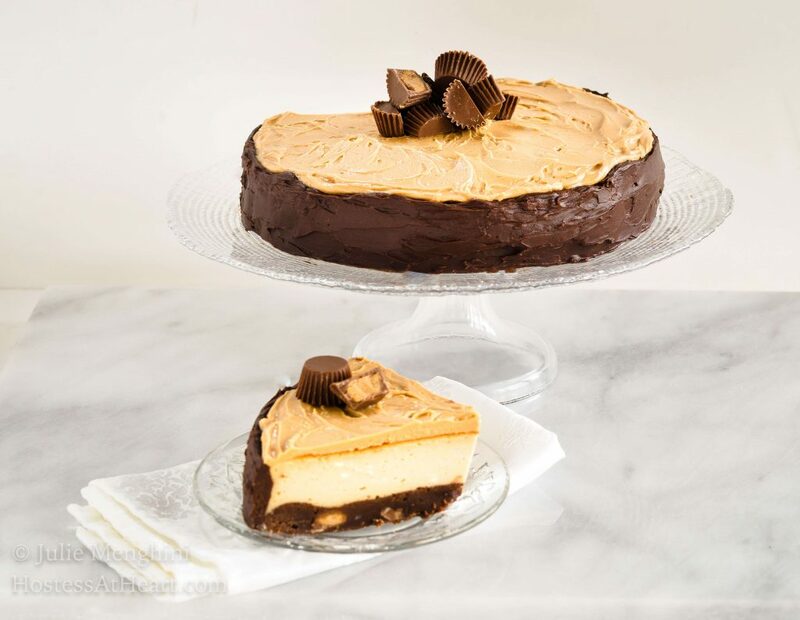 Spread the chocolate ganache along the sides of the chilled cheesecake and spread the peanut butter glaze over the top. Garnish with additional peanut butter cups. The only thing that I did differently is that I used a 9-inch springform pan instead of an 8-inch. My cake isn’t quite as tall as Dini’s cake but it worked just fine so you can definitely use what you have. Always check the cake for doneness before the lowest cooking time when you adjust the size of the pan. Gift yourself or a loved one with this book available on Amazon. I want to thank Dini for all of the work she put into this book as well as her generosity. Just one question though. Hey, Dini when is the next book coming out? 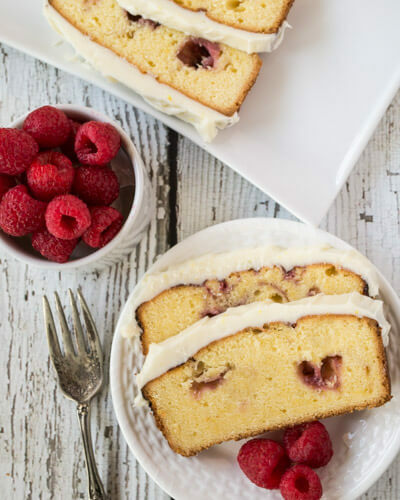 Now if you love a cake like I love cake here are a few more that we love! 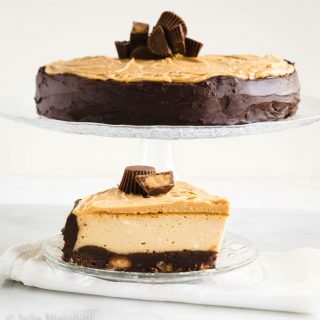 I’m absolutely drooling over this cheesecake, Julie… Cheesecake is my absolute favorite dessert, and the chocolate and peanut butter combo just puts it right up over the top! Thank you, Michele! 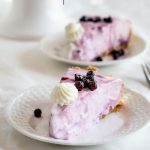 This is one delicious cheesecake too! This looks phenomenal! I am getting this cookbook ASAP!! Thank you, Michaela! This is a beautiful book and well written. I love Dini’s cakes!! I can’t wait to get her book. This looks so droolworthy! Thank you, Christie! Her book is a work of art! 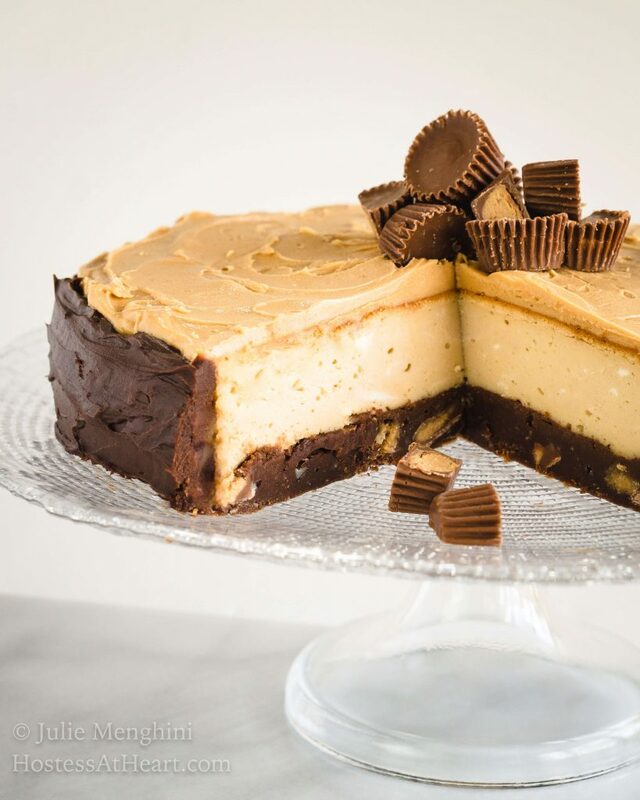 Mmmm I adore cheesecake… Oh Julie I like gained 5 lbs drooling over this lovely creation of yours!!! YUM! I feel your pain, Deanna! I need to go on an air diet LOL! Thanks for stopping and enjoy your day! Great cake. Love it! And very nice combination of flavors. Thank you so much! Thank you for stopping by and good luck with the giveaway! Oh Neha, there is peanut butter cups stuffed in the brownie layer too! It’s crazy amazing. Thank you for stopping by and your sweet comment! Good luck with the giveaway too! I love the way you roll, Karen! There are so many beautiful cakes to pick from in this book. Thank you for stopping by and good luck with the giveaway. 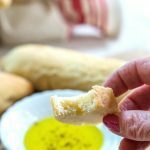 Since I already bought the cookbook… (its amazing!) I would give the winning one to my niece who is the Baker of the family! She would LOVE it! Of course, she may be getting it anyway for Christmas… thinking I should just go buy her one! I bought it too and got one for my daughter. She’s a good little baker and loves getting fancy. I think it’s safe that she will not read this comment since it’s under the tree! Thanks for stopping by and good luck with the giveaway! It is such a beautiful book! Thank you for stopping by and good luck with the giveaway! Funny, as soon as I read “buckeye” I thought of buckeye nuts from the state tree of Ohio and also the candies I made awhile ago. My candy looks just like buckeyes (peanut butter balls covered 2/3 with chocolate). 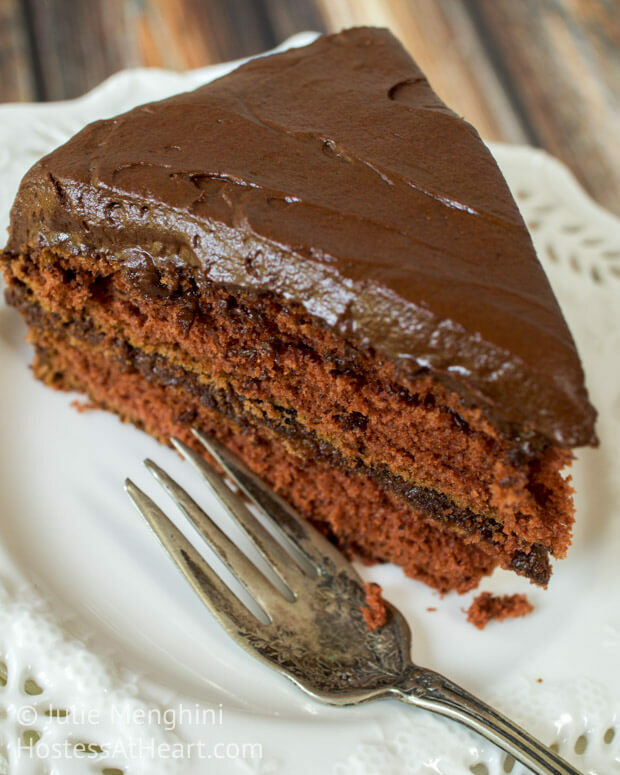 I guess this cake qualifies as it does have chocolate and peanut butter. Sure looks good Julie! Thank you, Judi! 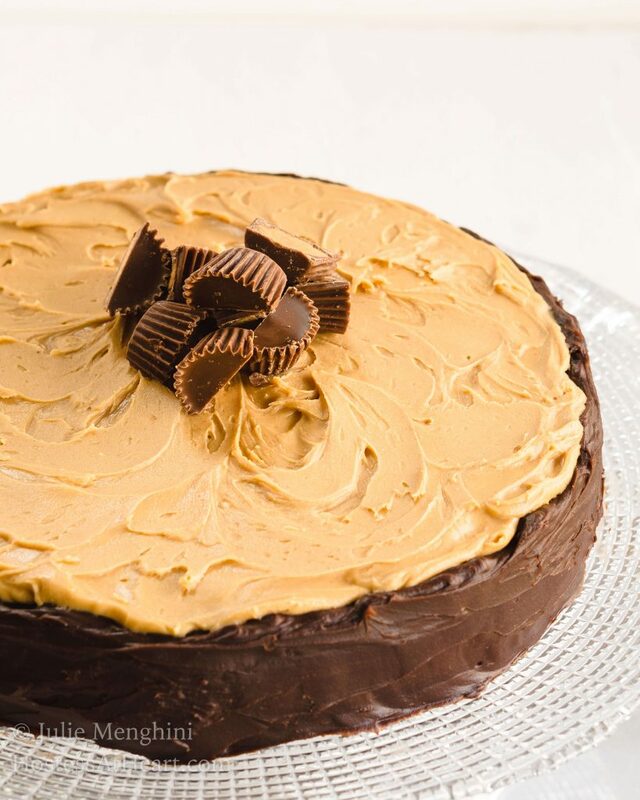 I’ve seen the buckeye candy and what’s not to love when you have peanut butter and chocolate! 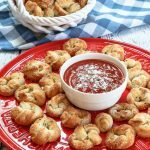 This is from Dini’s new cookbook. It’s such a beautiful book that I hope you enter the giveaway. What are you doing for the holidays Judi? This is the first year in your new home, isn’t it? Check, check, check! I followed the steps! Would love to win! Thank you for stopping by Midori! Good luck with the Giveaway, it’s a beautiful book! Julie this is definitely a drool worthy cheesecake! I can only imagine how envious your husbands co-workers must have been! Thank you, Marisa! It was so good and I’ll be repeating this one. Happy Holidays my friend! Wow! I just had a neighbor deliver to traditional little buckeyes. This is kind of mind-blowing! I love neighbors like that. I just had one deliver a plate of cookies and she has 4 boys…3 under 3…I’m not worthy! wow. i bet that is one amazing cake. too much work for me, but i can just stare at your photos instead! There were a few steps but none of them difficult and boy was the results tasty!